My husband loves clay pot chicken rice and when we were living in Kuala Lumpur, Malaysia, we used to go out to the surrounding coffee shops which served them. Usually they were cooked over a charcoal stove and this indeed gave this dish a distinctive flavour; a good smoky fragrance with some burnt crust at the bottom. If you do not have a clay pot and would like to cook this dish, do not fret, I have an earlier post on Claypot Chicken Rice cooked in a conventional rice cooker that you can use. Today I would like to share with you this dish which I have cooked in a clay pot over a stove. Sorry, can’t cook it over a charcoal stove because don’t have one! 😦 But it still tastes much better than cooking in the conventional rice cooker. If you do not have a clay pot at home and are considering buying one, a sand clay pot is highly recommend. Its unglazed porous clay bottoms will impart a good smoky fragrance. Since I already have a glazed clay pot, I use it to cook mine and it still smells and tastes so good. This is a great one-pot dish and it is not too time consuming to cook. Can you smell the smoky aroma coming from my kitchen? Dinner is ready!! Cut the chicken into bite sizes then rinse and drain well. Put the chicken into a bowl and add the rest of the ingredients for marinating the chicken and mix well. 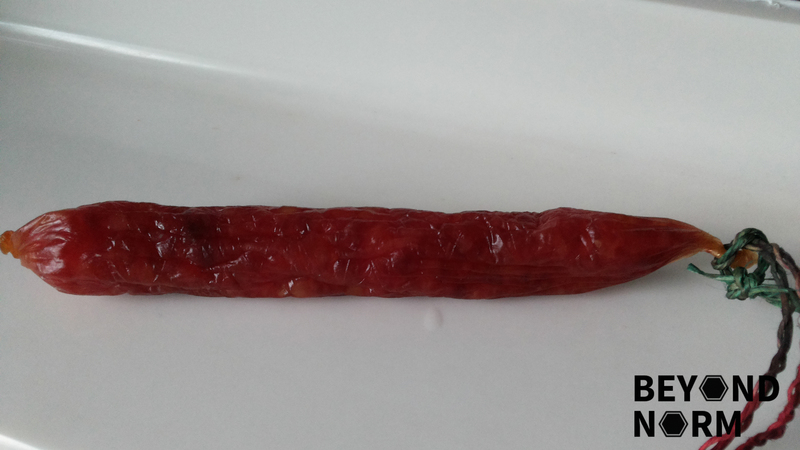 Pour some hot water over the Chinese waxed sausage(s) and leave it (them) in the water for about 3 to 5 minutes. 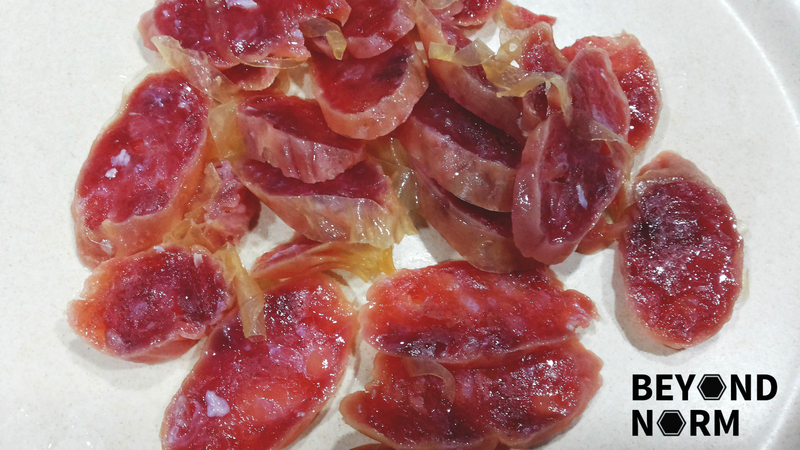 Drain the sausage(s) and slice it (them) into thin slices and set aside. Soaked the mushrooms in some hot water till soft. 10 to 15 minutes before cooking your rice, take the marinated chicken out of the fridge. 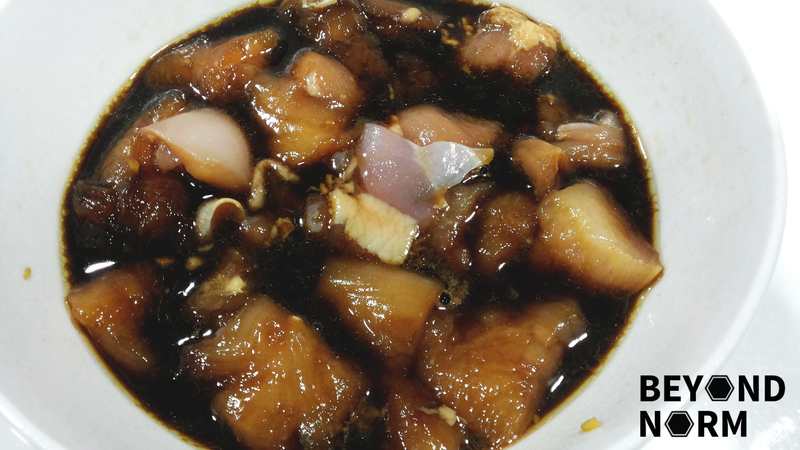 Then mix the sliced mushrooms into the marinated chicken. Heat up the clay pot then put in some oil and brown the sliced salted fish. 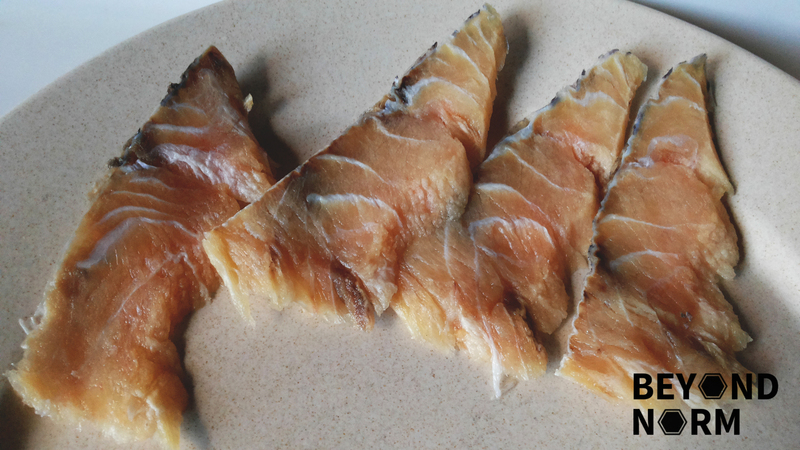 If you are using “Mui Heong” salted fish you can skip this step. Dish up and set aside. Pour in the 2 cups of stock (or water) into the heated pot. Add the 2 cups of rice into the pot and cover to cook over low flame for about 6 to 8 minutes or till all the liquid is almost absorbed by the rice. Open the lid of the pot and put the marinated chicken pieces and mushrooms on top of the rice. Lay them on one single layer to ensure that the meat is cooked evenly. 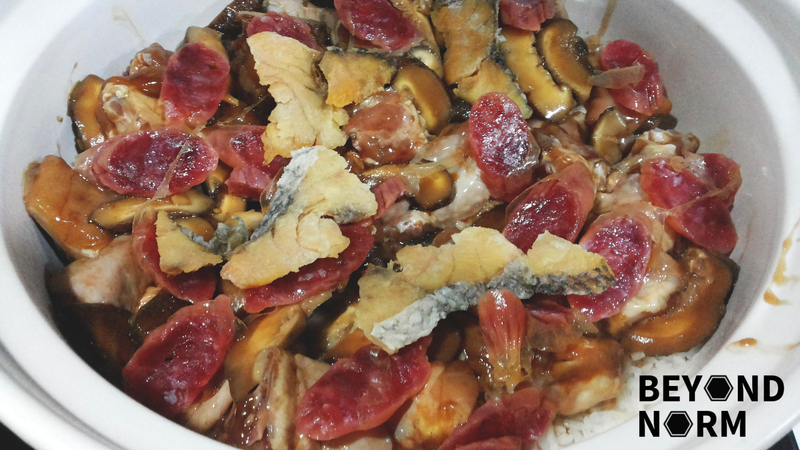 Add the sliced sausages on top and the slices of salted fish into the pot. Before covering the pot, when I find that my rice is too dry I will add another 2 to 3 tablespoons and let it cook for another 10 to 12 minutes. Now prepare the sauce. Mix all the ingredients in a bowl. After about 10 minutes of cooking, open the lid and drizzle in the sauce. Cover and let it cook for another 2 minutes or so and depending on the strength of fire and type of pot, the timing may vary. But it is easy to check and see if the meat is cooked. Once it is cooked, turn off the fire and remove the pot away from the heat. Before serving, drizzle the dark sauce, garnish with diced spring onions and cut red chillies. When eating, give the rice a stir first and if you like the crusted rice you can scoop some from the bottom of the pot. I have varied the ingredients. I paired the claypot rice with a plate of restaurant-style Green Vegetables with Oyster Sauce (recipe to follow in my next post).